Have you seen kobe sliders on every restaurant menu lately? It's the newest trendiest food, last year. 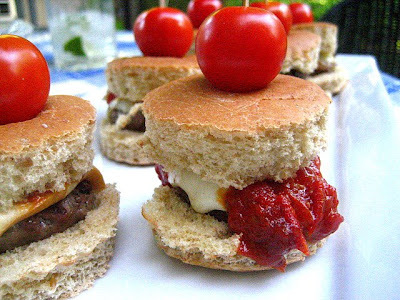 Little hamburgers on little buns with cool toppings. If you ever eat at Little Owl in NYC, try their meatball sliders, it's their signature appetizer, and they are so damn good. But the real slider, really spelled slyder, was invented by White Castle, the oldest fast food chain in the country. They coined the phrase "slyder" and they were little square hamburger patties with minced onions and were sold in the 1940's for a nickel a piece. No, I am not old enough to remember them being a nickel, but I do remember going to White Castle at 1 a.m. with my high school friends for a dozen "rat burgers", as we called them back then. They had a unique taste all their own and were really disgusting. I made sliders this weekend and since I couldn't find small buns to fit the small burgers, I used a biscuit cutter to cut regular hamburger buns into small size. I made delicious toppings of Gruyere cheese with caramelized onions, and spicy tomato jam with smoked mozzarella (the winner). Everyone went crazy over them, and they were so easy! I will be making these all summer long. I'm loving the jam option - looks really good!!! These are adorable - and a nice idea for a gathering of friends. 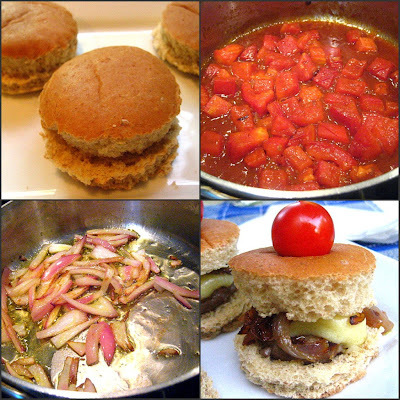 A fellow dieter of mine has a great recipe (actually rather healthy comparatively) for sliders with the onions and flat square meat. I've not tried them yet but then I have never had a White Castle either. I know how could I not? But she suggests using the small dinner rolls (I think they are called snowflake) that are also square. I'm thinking I should go look at the recipe again and see if I have or can get everything to make them. White Castle is the BEST when you're drunk and hungry! When you're sober and crave a bit more of an upscale nosh, your sliders would fit the bill! Love the tomato jam!!! I don't think I need an entree if I can eat this delicious appetizer. Doesn't matter how small, I just eat lots ... if I am allowed. Oh good idea with the biscuit cutter Stace! I remember eating White Castle in the 60's, don't remember the price though, my parents were paying! Well, my dear, I AM OLD ENOUGH... very... and loved to grab a White Castle or two for TEN cents each on the way home from Orange High School in the 40's. I always requested "extra pickles". When I walked in the door my Mother would say "you've had a hamburger". I'll take three with extra tomato jam and onions - they look fantastic Stacey. My earliest memories are 15 cents. We used to go to the one in Verona, NJ where they still had car service. In college (Rutgers) we used to make "Castle Runs" at midnight during our study breaks (right!). I even made a video (3/4" Beta - 1982) for a class, documenting one of these hamburger orgies. I didn't know there was a built-in microphone so I told my actors (roommates) they could say whatever they wanted. Boy was I surprised when my professor told me to turn the volume up so he could hear. Got an "A", though. I think I invented reality TV back in 1982! Now that we (roommates) are successful (Dir. of Worldwide Marketing at Kodak, Urologist, and me) we like to call them "Chateau Blancs" because we have class now. We drink Pinot Noir with them, instead of Budweiser. Anyway, I have come up with a great recipe for Chateau Blancs... filet mignon, sliced about 1/4" thick. Shallots instead of onions. Sweet Gherkins instead of pickles. Tillamook Cheddar instead of American Cheese. Cook them in a non-stick skillet or on a non-stick pancake griddle. Cook them the same way... use the bun to steam them so you don't have to turn them. M-m-m good! Hi Stacey... hi to Henry! I haven't had White Castle since I was a really small child. After seeing "Harold and Kumar" I have wanted to go back and see if I could really crave something that badly. Your variation I'm sure is much better. Clever trick with the buns. I tried to make mini burgers on biscuits once, but biscuits are too delicate and thin. Oh, BTW, my personal best? 15 cheeseburgers, plus two fish sandwiches, in one "Run". Occasionally I would order the "Surf n Turf" (a hamburger and a fish sandwich in the same bun)! Ah, those were the days! I have often thought of making a sequel to my college video, using my now successful roommates... what would I call it? "Castle Run 2: After all those Runs", of course! These look so cute with the little cherry tomatoes! And good tip about the small buns! Tomato jam with smoked mozzarella sounds fantastic! I love sliders. I make mine with Garlic powder, ketchup, cheddar cheese, Paprika, Fried onions and Cajun Spiced mayo :) yum! I want some!! You had me at the kobe and smoked cheese! I guess I must be the only person in the world who has never been to, or eaten White Castle burgers. What... did I grow up in a box? Sheesh. Love the cherry tomato toppers! I make meatball sliders for parties, always a big hit too. You're making me real hungry for a burger, it's dinner time and all I had today was an egg white omelete! Oh, would you post that tomato jam, that sounds delish! They look great. I love the idea of using the biscuit cutter. Not sure I would've thought of that. How cute! They look delicious and I love the tomatoes on top! In high school, I would get the six pack at White Castles...except we called them murder burgers. I would much prefer your version! I love the sliders at the Little Owl! Great idea to use the biscuit cutters for mini buns! There was a White Castle just outside the Fordham Campus. It was famous for late night snacks! I've learned a nice little secret here about the buns - cutting them with a biscuit cutter. Very clever Stacy. I can never find the tiny buns so I haven't made sliders yet. Oh yum! These sound WAY better than Whitecastle! Although, late night greasy nastiness is always a hangover cure. :) Would you believe that when I was in college we would all head to the local Chevron station for "chicken on a stick," after a late night. It was a small town and there weren't many options - but now I realize how gross that was! My grandpa used to adore White Castle and the rest of my family could never figure out why (based on the taste). 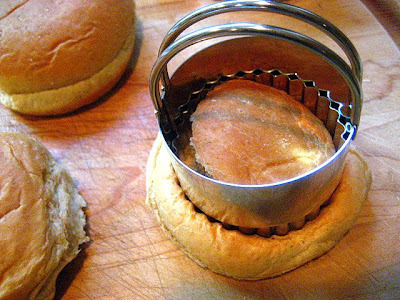 Great idea to cut the buns with a biscuit cutter. What'd you do with the leftover bread? The only reason I've never made sliders is because I don't know about making my own buns. Duh. Nice improv, Stace! These look wonderful.